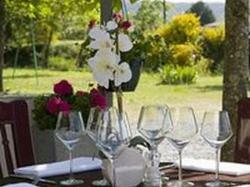 La Chapouliere is located in Ruoms, a few minutes from Vallon-Pont-d'Arc and near the Ardeche region. The hotel offers an outdoor swimming pool and a gourmet restaurant. Each guest room at the Chapouliere has free Wi-Fi access, a TV and a private bathroom. The restaurant serves refined cuisine along with a fine wine selection. Guests can relax with a drink in the lounge bar or on the shady terrace. La Chapouliere also provides free private parking. This elegantly decorated suite offers views of the Rocher de Sampzon and includes a lounge area. This room features an elegant décor and offers a TV and en suite bathroom facilities. This room offers views of the Rocher de Sampzon, the hotel's garden and the swimming pool.